This summer we were strolling through downtown Nashville, TN on a nearly 100 degree day seeking shade and an escape from the competing music blasting from each bar. That’s when we turned down a small street and saw PUB 5 with closed doors and no music at all – just a soccer game playing in the background and mostly empty tables. It was the perfect space to settle in, get some drinks and read through the exhibit brochure I’d just picked up at the Frist Center for the Visual Arts exploring Maira Kalman’s Elements of Style. I love Strunk & White’s writing style guide anyway, but Kalman’s whimsical illustrations make it an adventure, not just a reference book. You should check it out. But back to the restaurant, what I ordered and the reason for this post. All the Tennessee biscuits and road trip snacks had caught up with me so I just wanted a simple salad. What I got was so much more. This apricot kale salad uses a tangy apricot vinaigrette that is lightly massaged into the kale. This simple salad would stand alone, but then it’s topped with dried apricots and Parmesan cheese. It became our summer go-to after I learned to recreate it. And it was a perfect summer for this salad because our garden actually produced. 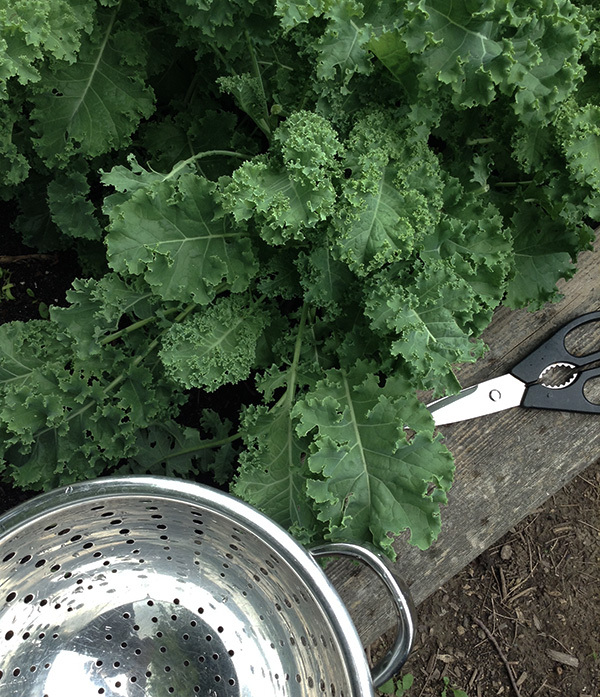 The kale was in full force through June and I was so sad when I harvested the last of our spring crop. 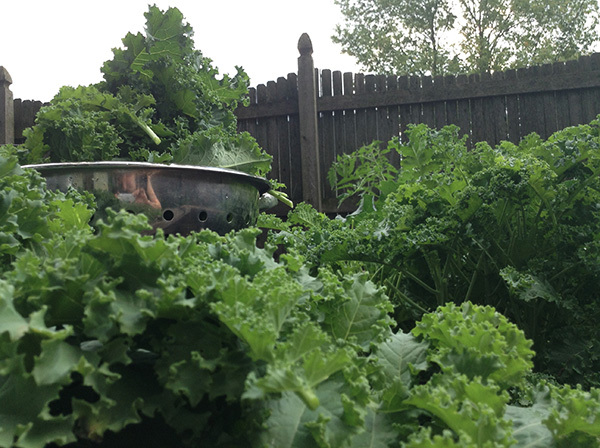 Now that the summer heat has faded, our fall crop of kale is growing again and I’m eagerly anticipating all the fresh kale salads we’ll soon have again. You can make this salad with any type of kale, but soft curly blue baby kale, cut fresh from your garden, is really the way to go if you can. 1. Mix all dressing ingredients together in food processor or blender until smooth. 2. Store in airtight container in refrigerator until ready to use. Lasts approximately a week. 1. 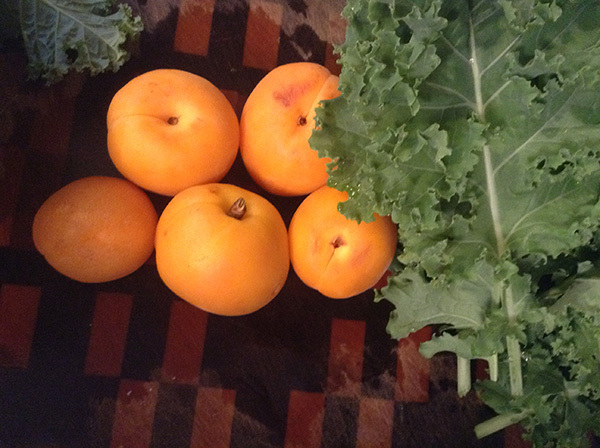 In a large mixing bowl, lightly toss the kale in 1/4 cup of apricot dressing. Gently massage until the leaves wilt slightly. If you need more dressing, go for it. 2. After the leaves are evenly coated with dressing to your liking, top with the dried apricots and cheese, toss then serve. ** This amount of salad is good for dinner with friends. If making for one or two people you might want to make a little less. The salad can be kept in the refrigerator, but the kale will continue to wilt and you’ll get a fair amount of liquid in the container making for some juicy salad leftovers. Not bad, but not the best thing ever. I hope you find a place to land soon and at least get to start a tiny container garden!